Lindy Bout is an event dedicated to providing a fun, joyful, safe, inclusive, playful environment. As a Lindy Bouter, you are a valued and unique part of that environment. Here are a few priorities which are deeply important to the organizers and the Lindy Bout community. All Lindy Bouters are expected to read and follow the guidelines below. Everyone is entitled to an environment free from harassment. This environment is for everyone regardless of gender/gender identity, race, sexual orientation, disability, physical appearance, religion, age, or dance experience/skill/style. Lindy Bout will not tolerate harassment of any kind. This includes homophobic, racist, misogynist, ableist, transphobic language, unwelcome sexual language, inappropriate touching, and inappropriate comments on physical appearance. All participants are entitled to enjoy the thrill of partner dancing without having to confront unwelcome interest or inappropriate comments on their body or physical appearance. 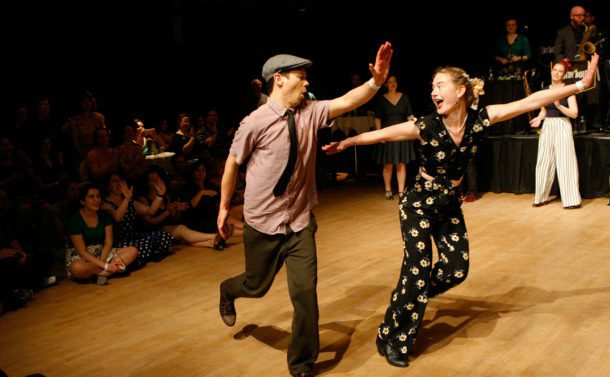 Anyone can ask anyone else to dance, regardless of dance role, level, or involvement in Lindy Bout. Anyone can say no to a dance without obligation or excuse. Have care for the safety and comfort of your partner and those around you on the dance floor. Air steps (aerials) on the social floor are unsafe and will not be tolerated. Save them for jams, competitions, and performances. If you or your partner bumps, kicks, or otherwise interacts in an unsafe way with someone else on the dance floor, check that all are okay before continuing to dance. Alcohol is served at Lindy Bout. Please consume responsibly, which means committing to never drive a car under the influence and reflecting seriously upon your personal limits and how you may act while under the influence. Inebriation is not an excuse for harassing behaviour. Lindy Bout bar staff are all Serving It Right certified and will promote safe and responsible drinking by recognizing the signs of intoxication and, in keeping with the law, will not serve patrons past the point of intoxication. Consumption or providing alcohol to those under 19 years will not be tolerated. Cannabis may not be used on the premises of Performance Works. If you are visibly under the influence of alcohol, cannabis, or other substances, or if you are behaving inappropriately or in an unruly manner, we reserve the right to remove you from Lindy Bout. In short, be a positive and considerate contributor to, and participant in, our joyous celebration of dance and music. Event directors and Safer Spaces Advocates will listen with sensitivity, without judgement, and will attend to all concerns brought forward with care and discretion, according to the needs and wishes of the concerned party and the severity of the concern, in a timely manner. Event directors may take any action they deem appropriate, including warning the offender or expulsion from the event with no refund. If you experience, witness, or hear of a violation of this code, or an instance of behaviour that causes you concern, there are a variety of things you can do. Speak to a Safer Spaces Advocate. Beth (she/her; Saskatoon); Devon (she/her; Victoria); Kaitlin (Vancouver); Leah (she/her; Calgary); Liana (they/them; Victoria/Vancouver); Tynan (he/him; Vancouver); Tyrel (he/him; Edmonton). Speak to an event director (Stephanie Taylor or Eileen Jones). Speak to an event volunteer, who will direct the concern to an event director or Safer Spaces Advocate. Speak to a friend, someone you’re comfortable with, and ask them to join you in speaking with an event director or Safer Spaces Advocate or speak to them on your behalf. Send an email to saferspaces@vernacularjazzdancesociety.ca. We welcome feedback and comments on our Code of Conduct. You can contact us at saferspaces@vernacularjazzdancesociety.ca or speak to an event director directly. This code of conduct was updated March 28, 2019. On November 10th, 2018, the Lindy Bout Event Directors made a statement about an issue in our community.